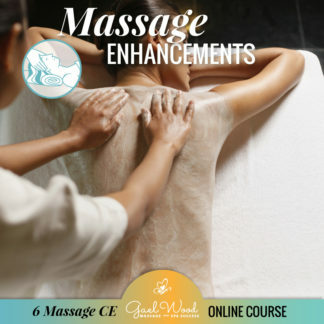 Now with 3 NCBTMB Approved Massage Continuing Education Credits! Does your state accept this class? Check the NCBTMB MAP HERE. Learn EXACTLY how to rebook massage and spa clients! Are you struggling to build up your massage or skincare practice? Do you wish clients would rebook effortlessly without an awkward conversation that leaves you feeling “salesy”? If this is you, I can help! Hi! I’m Gael Wood, when I started out as a massage therapist 20 years ago I didn’t know what to say to get my clients re-booking and referring. I just couldn’t figure out why my clients weren’t rescheduling, even though everyone said my massages were excellent. I had to figure it out, or get a new job! I’ve spent many years and thousands of dollars learning business building strategies. Now let me help YOU build your dream business. Did you know the most common reason clients don’t come back have nothing to do with the services? It’s true! Usually it’s small details that were overlooked or they were simply not invited back. Don’t let your clients leave unhappy or wondering what they should do. 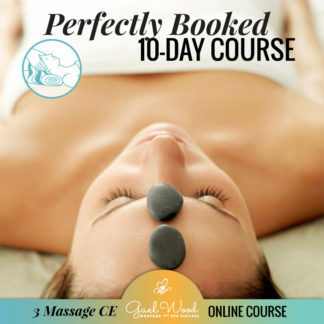 Rebook massage and spa clients and get a constant stream of referrals like a pro! Kick old beliefs to the curb and learn exactly what to say, when recommending service and treatment plans to clients. Expertly consult with clients so they feel heard, and re booking is a breeze. Customize all of these materials to your personality, and business. There is no need to feel fake scripted or like a salesman! Learn the important actions you can take during the treatment to make sure your clients are 100% completely comfortable and relaxed. 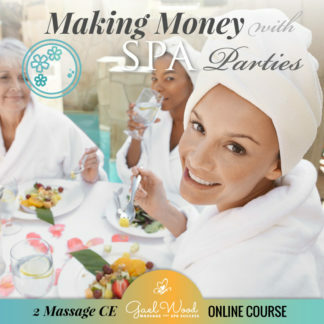 Plus, details that will set you apart from other therapists, and turn any room into a luxurious spa! Sell products ethically and successfully. Did you know that clients return to businesses where they purchased a product more frequently? Increase your income while adding value to your services! Overcome fear and quickly build a loyal clientele and secure income. A PDF download of the class materials to keep forever! Essential phone skills to get clients in the door, and already thinking about their next session! Turn your clients into raving fans that refer, rebook and can’t wait until their next appointment! Me! 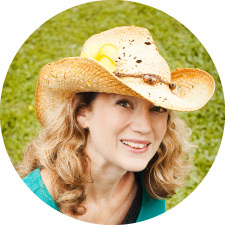 I’m Gael Wood, and I have been a Massage Therapist and Esthetician for 20 years. I have run a successful Therapeutic Massage office, a Day Spa, and currently a mobile massage business. I LOVE business and marketing and have studied it for years, and now I want to share what works for me with other therapists. I am also a NCBTMB approved continuing education provider, author and online entrepreneur. Any Massage Therapist or Esthetician who is ready to take action, learn new things, and build a great business! I work for somebody else, will this class still help me? Yes! It doesn’t matter where you work, a full schedule still means a great paycheck. Plus, you will be in the front of the line for raises and job security with all of your new skills. You can start this class anytime. Don’t spend another minute wondering why clients don’t come back or if you will be able to pay your bills. Take action now, here are the tools to take control! This class is included in the Thriving Therapist Mastermind. Join today!